Yep, I know there is a blizzard of on-line magazines trying to swamp our screens, but this new, New Zealand magazine, on saltwater fishing is looking good. Quite rightly New Zealand’s trout fishing gets a lot of press, but our saltwater fishing is world class as well. See the April edition, and previous editions here. This New Zealand fly fishing magazine’s third issue is now up on-line just in time for our Summer. The ‘Jump Shot Issue’ has a bunch of cool jump shots, Chris Beech from Australia put together a cool spread on fishing for Queenfish in Northern Australia, Paul McDonald from Hamilton shares tips on landing big fish and if that’s not enough there are flies from Zane Mirfin, a gear review from Gary Lyttle and a bunch of other stuff which you’ll just have to check out for yourself. This magazine is developing nicely – still a bit rough around the edges in terms of design and production values, and copy editing, but the good content standard overcomes these niggles. Jason, my middle son and I sneaked away one evening for the three and a half hour drive to Taupo, and on to Te Rangiata. Bright and early next day we headed for the Hinemaiaia River. The Hinemaiaia is a pretty little river, but it is very difficult to fish. First the bush grows right to the river’s edge in most places and the bottom is a veritable minefield of snags. But there can be some good fish in amongst the jungle especially this time of the year, and some very big browns are regularly pulled out around this time. The upper Hinemaiaia is closed from end June to December 1 to allow for spawning, so by going just a day or two since the river opened we were likely to be fishing to trout who had not seen too many anglers. Well, few anglers or not it was hard and hot work. The early summer sun was pretty fierce. Jason got 4 or 5 fish, I managed two or three, nothing big, but all over 45cm (18”). But the highlight of my session was seeing two fighting Jacks, swirling and turning as they drifted, fighting, downstream. They passed just inches from my legs, totally oblivious to my presence. Twice they chased each other to the top of the pool and then drifted down again, once I thought they were going to touch my legs. Magic moment. By early afternoon Jason and I had had enough of re-rigging from flies lost to snags and we headed off to the Tongariro. I fished the bottom of a shallow run, below a guy at the head. I watched as he pulled out three fish without me getting a touch. But when he left I slipped in, and fished without a touch. The guy who I had watched, moved down the run, I little below where I had been fishing and pulled out another fish. Then he moved to another braid of the river and I watched him pull out another fish. That was it, frustrated and still fishless I wandered over to see what brand of dynamite he was using. His rig was basically the same as mine. A gold ribbed Hare’s Ear with a bright orange tungsten bead on a #12 hook, then tied off the bend of that hook, a Gold bead Prince Nymph #12. We had roughly the same length leader. So why was he catching fish, and I watching? Who knows. But I have seen this happen so many times before, sometimes I have been on the successful side, often not. I guess it must be that quite subtle differences in the weight, shape, colour and bulk of the flies, and the way they drift that determines which will get bit and which will not. Still it might be my turn next time, and that is part of what keeps me coming back. 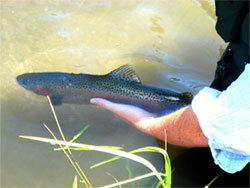 For North Island, New Zealand, fishermen it is coming up to the peak rainbow trout season. From May through to October, our Winter and through to Spring, these beautiful silver fish, rainbows flecked with red, fat with autumn feeding will make their way from the lakes up the rivers and streams to spawn. Top fly-fishing time, top fish, and time to make sure your gear can handle it. Have a look at this checklist. Well a couple of weeks ago I was fishing on the Tongariro and was experiencing a hard morning, I had caught nothing, hooked nothing. Then I started fishing below a lad of around 17 fishing the top end of a long pool. I watched as he hooked five fish and and landed three. My feet were getting cold so I wandered up the bank, heading to the next pool, but as I passed the lad he also came out of the water to warm up. We started chatting and he recognised me, and became keenly interested in the flies I was using. I quickly made it clear that I was much more interested in finding out what he was using, because whatever it was it was at least five times better than anything I had tied on. Once I looked at his flies I quickly realised that it was not so much ‘what’ fly, as “what size’ fly. He was using size 14 and 16 nymphs, no gold bead, un-weighted, behind a thumping great heavily weighted ball of lead disguised as a nymph. Now normally in a big river like the Tongariro I would not go below a size 12 nymph, usually weighted and always sporting a shining gold bead. They get to the bottom alright, but I guess they move pretty unnaturally once they get there. The little un-weighted nymphs, I surmise would really move about as the big currents moved them, much more naturally. What ever the reason, they worked. So my new fishing companion and I moved on up the river catching a heap of fish, all on the little beasties. Fish I guess I would not have caught that day if I had not asked a question. So, with a simple question I shattered my myth, ‘big water, big flies’, – a myth I had obviously been carrying around too long. The Taupo region, central North Island, is best known as a winter (May – August) fishery. This is the time trout move out of the lake into the many rivers to spawn. But this ignores the wonderful fishing that is available over summer, when the restriction on sections of most rivers to allow uninterrupted spawning are removed. It also ignores the fact that many fish enter the rivers to spawn all year round, although in nowhere near the numbers of winter. It is also true that there are far fewer anglers as well. A couple of weeks ago I fished the upper regions of the one of the most popular rivers and saw not one other angler, on a Sunday, and 7kms each way up and back. The fish in general will be smaller than the winter on average – but big fish do lurk in deper pools. From Febuary on, browns move up river, some of these fish are really big. There are also so-called ‘resident’ fish. These are fish that have moved up river to spawn and then stay upriver. The only real annoyance is likely to be hordes of 8″ to 12″ fish, last winters crop feeding up before heading down to the lake in Autumn. As an idea of the fish available, here are two photos of fish caught by my youngest son a few weeks back. The silver fish is a maiden hen on her way up to spawn. She would be close to 18″. The other darker fish is a hen that has very recently spawned and is on her way back down river. She would have been over 20″. I have just spent a couple of weeks fishing in the Taupo region. Well fishing is stretching it a bit. The first week the weather was atrocious, snow, rain persisting down, and gale force winds – and that was the good bits! But it cleared up; I stopped swearing at the weather, which I have noticed in the past seems to have absolutely no effect on it what-so-ever, and went fishing. I had already decided that I was not not going to fish elephant-gun tactics – chucking and ducking nymphs the size and weight of a 9mm bullet, or heaving out fast sinking shooting-heads, in the big water of the Tongariro; this has well and truly lost its charm. So I wandered up the smaller rivers. But I had forgotten that it was school holidays – what clown decided to give kids holidays in the middle of winter? So I attempted to fish the pools away from the teeming, water-thrashing hordes. This proved to be frustrating; regular floods have filled these unpopular pools with trees and the bits of same. Every drift it seemed would hook up on some bit of drowned timber or other. But there were fish there, deep in the jungle. Smart fish these Kiwi trout. Help was at hand though, and I yet again grateful for a life-time habit of reading extensively. I had a month or two before read a book, ‘Tying Flies with Foam Fur and Feather‘ by Harrison Steeves. I had even got round to tying a few of these monstrous creations. Hidden away somewhere in that book was Harrison’s observation that he uses his foam flies in winter. That piece of information, hopped out from the dark depths of my mind, and demanded action. So rather than lose more nymphs, I tied on one of the foam flies I had made ugly, tied a little gold-beaded thingy fly about 10cm away from the bend of the foam fly. Then I launched this combination out over the subterranean forest, with absolutely no confidence at all. First drift, and the foam fly was monstered by a hen rainbow of 3kg (6lb). She and another four fish of around the same weight hit the fly, realised too late their mistake, but finally swam away once I removed the hook. Three more pools, pretty much the same result, give or take a few fish up or down. Next day, more of the same, and the next, and the next. The most surprising thing to me (after finally trying using a dry fly in winter) was the number of anglers who walked past, saw what I was doing, shook their head at the antics of the ‘old duffer’, and carried on to fish the crowded pools. Hope they never read this! So they say that if you don’t learn something new every day, you had better pinch yourself, because you might be dead. It just seems to me a great shame that learning about foam flies in winter has come so late in my fishing career. Posted on July 18, 2006 September 1, 2010 Categories fly fishing how-toTags dry flies, fly fishing how-to, fly tying, foam flies, New Zealand fishing, winter trout fishing1 Comment on Dry Flies in Winter? If you were to read the magazines, watch videos, and view reports on the net, you could get the impression that New Zealand fly fishing was confined to the South Island – or the ‘Mainland’ as South Islanders call it – and confined to Summer. Not so! The South Island Fishery has a great deal going for it; big fish in clear water, demanding fishing even for good and better fly fishers. Most South Island waters are open during Summer, but closed during Winter. But the North Island too, has superb fishing, in clear streams and rivers as well, especially throughout the central North Island, and especially for anglers prepared to venture off the beaten tracks. But many of these streams and rivers are closed over Winter as well. So what do do over Winter, apart from tie flies, tell lies, and wait? So what is the attraction of this fishery; remembering it is often colder than a mother-in-law’s stare? Well trout that average 2.2kg (4.5lb) is for starters, for more go here.